The dressing is a simple blend of buttermilk, apple cider vinegar, a touch of mayo, onion, sugar, salt and pepper. 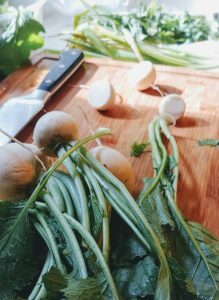 It’s a sweet and light dressing that doesn’t weigh down the salad and really allows the crunch to come through. 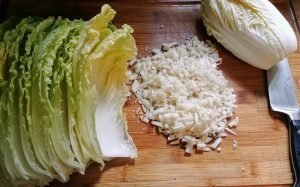 You can add some apple slices or a bit of feta or bleu cheese too. 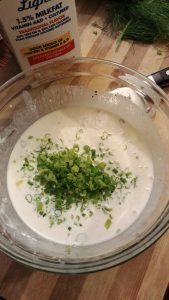 Whisk together buttermilk, mayonnaise, vinegar, shallot/onion, sugar, 1/2 teaspoon salt, and 1/4 teaspoon pepper in a large bowl until sugar has dissolved, then whisk in scallions. 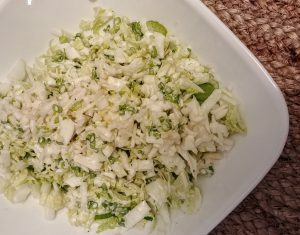 Toss cabbage, turnips, and celery with dressing.